Americans’ relationship to the news is being transformed in several directions thanks to the new tools and affordances of technology. Encounters with news are becoming more personal as users customize their experience and take charge of the flow of news into their lives. News is becoming a shared social experience as people exchange links and recommendations as a form of cultural currency in their social networks. And news is becoming a participatory activity, as people contribute their own stories and experiences and post their reactions to events. This chapter explores these changes in more detail. Recall that earlier in this report we noted the evidence in this survey that people’s connection to the news is a social activity equally as much as it is a learning activity and productivity enhancer. Some 72% of Americans who follow the news at least now and then say they enjoy talking with friends, family, and colleagues about what is happening in the world and 69% feel that keeping up with the news is a social or civic obligation. Moreover, in the age of technological social networking, some now say they rely on the people around them to tell them when there is news they need to know. Half of Americans (50%) say that describes them very well or somewhat well. How does this play out online? The act of sharing of news and conversation about news is an integral part of email exchanges and social media activity. Of the 71% of the adult population who get news online, 75% of them say they get news forwarded to them through email or posts on social networking sites. That amounts to 71% of all internet users. When news is passed along to them, 38% of this cohort read the material all or most of the time; 37% read it some of the time, and 23% say they hardly have time to read it. 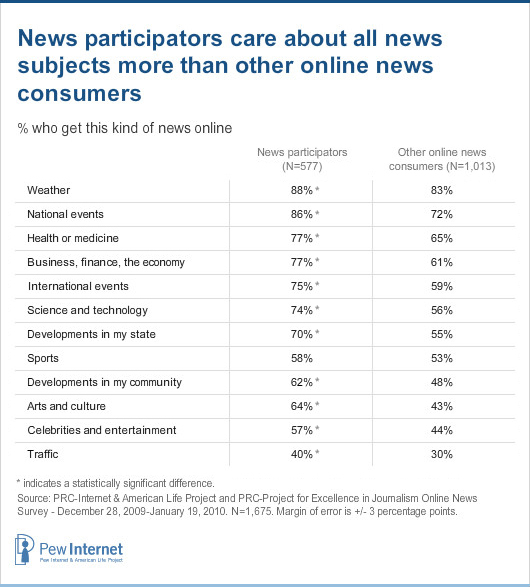 Of these internet users who get news online, 50% say they pass along email links to news stories or videos to others. (That represents 48% of all internet users.) Those who follow the news avidly, who are on-the-go consumers, who use social networking sites or Twitter or have a blog are much more likely than others to send along links to news in their emails than other internet users are. Beyond the chatter about news that takes place in email exchanges, a notable number of internet users are beginning to treat news organizations, particular journalists, and other news mavens as nodes in their social networks. In this survey we found that 57% of online Americans use social networking sites such as Facebook, MySpace or LinkedIn – and 97% of them are online news consumers. Some 51% of the social networking users who are in the online-news population say that on a typical day they get news from people they follow on sites like Facebook. That amounts to 28% of all internet users who get news via social networking with friends. 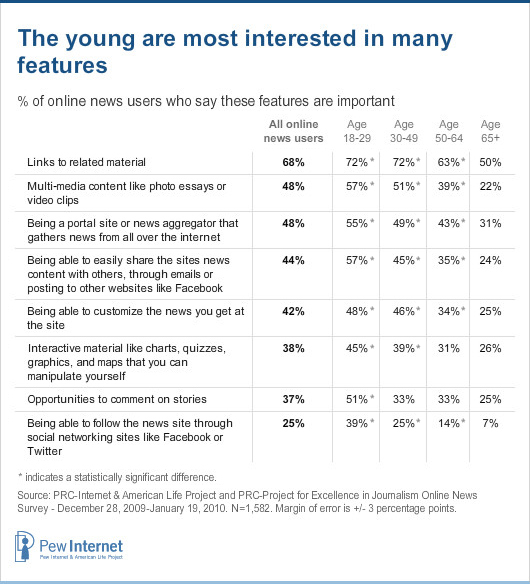 In addition 23% of the social networking users who get news online say they specifically get news from news organizations and individual journalists they follow in the social networking space. In other words, they have friended or become a fan of a journalist or news organization and they catch up on news through this relatively new channel of news dissemination. That amounts to 13% of all internet users. Overall, 30% of internet users get news from friends, journalists or news organizations they follow on social networking sites on a typical day. In addition, we found that in the general internet population, 19% of online Americans use Twitter or other status update functions. Of those Twitter users, virtually all (99%) are online news consumers. And 28% of those who are in the online news consumer cohort say they get Twitter updates about news from friends and colleagues they follow on Twitter and 18% follow the Twitter feeds of news organizations or individual journalists. Combined, that amounts to 6% of all internet users who get news via Twitter feeds. The importance of news to social experiences online also shows up in one other way in our survey. A significant portion of online news consumers judge news organization websites by the degree to which they facilitate the social sharing of news. Some 44% of these online news consumers say that one of the factors they use in choosing where to get news online is whether it is easy to share the site’s content with others through emails or postings on social networking sites. A quarter of these online news consumers (25%) say an important factor for them is being able to follow the news organization through social networking sites like Facebook or Twitter. As the table below shows, young online news users have substantially stronger attachments to the social features of websites than older users. Overall, the social dimension of websites ranked third on users’ most important priorities in choosing the news websites they pick, behind links to related material to the news story and the site’s willingness to be a portal that collects news from around the web. We noted earlier that 67% of Americans say they only follow specific subjects that are of particular interest to them. Online tools like news filtering and aggregator sites allow people to apply different kinds of customization to their news experiences. In this survey we found that 28% of all internet users say they have customized the home page on their browser to include their favorite news sources or topics. Interestingly, this does not seem to be a strategy of those who are trying to narrow the flow of news in their lives or as a coping mechanism for information overload. Instead, customization is used by the most voracious and wide-ranging news consumers. Those who use the most news media platforms on a typical day (4-6) and those who have the widest range of online sources (6-14) are far more likely than others to have customized their home page. Those who are involved with social media such as Facebook, Twitter, and blogging are also more likely to have tweaked their home page towards news that interests them. 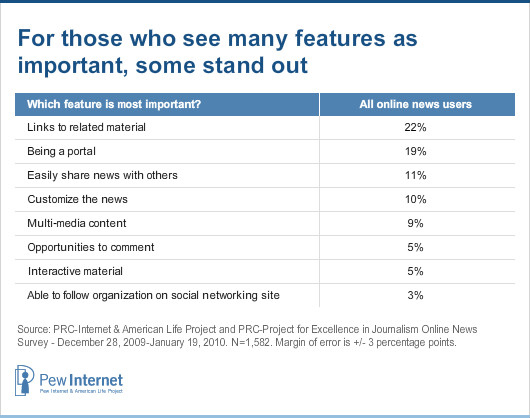 This preference among online news consumers also translates into a priority when they are picking news websites to visit. Some 42% of the internet users who get news online – or 30% of all internet users – say that it is important to them when choosing news sites to be able to customize the news they get at that site. It is fascinating to note that this feature applies equally as much to those who say they prefer to follow specific topics (51% of them like being able to customize news on a site) and those who say they rely on others to keep them abreast of news (52% of them like this feature on a news website). At the same time, disproportionate numbers of those under age 50, blacks, wide-ranging platform users and browsers for online news, and social media users say this is a preference for them on a news website. Another way that people personalize the news is by getting alerts about news developments. Some 71% of internet users say they get news forwarded to them through email and automatic alerts and updates and 11% of cell phone owners have alerts sent to their phones via text or email. Yet another way that people connect in a personal way with news is through interactive material. Some 36% of internet users (38% of online news users) say an important part of the news websites they choose is whether it has interactive content like charts, quizzes, graphics and maps they can manipulate themselves. Those who use a large number of news media platforms on a typical day (4-6), those who use a wide range of online news sources (6-14), and those who are interested in a diverse set of online topics are more likely than others to cite this preference for interactive material. Finally, there are several other ways that people can customize their online news experiences. In effect, they can create a kind of news “playlist” by using the internet to look at news events at the time of their choosing and to the level of depth that matters to them. In this survey we asked questions about people’s use of video content on news sites and found that 68% of internet users have watched a video online of a news story or event that happened in the past and 62% have watched a video feed of a live or breaking events. Those who use a lot of media platforms on a typical day, who have a diverse set of news interests, and who visit a relatively high number of online news sites are more likely than others to have used news sites this way. In effect, they are reallocating their attention to news to fit their own needs and schedule. 17% of internet users have posted links and thoughts about news on a social networking site like Facebook. That translates into 30% of social network site users. 3% of internet users have used Twitter to post or re-Tweet a link to a news story or blog. That amounts to 18% of Twitter users. News participators are information omnivores and technophiles. They stand out from the pack in the same way as those who have set up their cell phones to be “on alert.” In fact, among news participators, 19% have news alerts sent to their cell phones. News participators are fond of social media: 76% of news participators use social networking sites; 34% of news participators use Twitter, and 26% of news participators are bloggers. The average participator uses 4-6 media platforms on a typical day; seeks out nine or more news topics online; and surfs 3-5 different kinds of news websites on a typical day. The typical online news participator is white, 36 years-old, politically moderate and Independent, employed full-time with a college degree and an annual income of $50,000 or more. Interestingly, while white adults make up the bulk of the online news participator population, black internet users are significantly more likely to be news participators than their white and Hispanic counterparts. Almost half of black internet users (47%) are news participators, compared with just 36% of white internet users and 33% of Hispanic internet users. Not surprisingly, the youngest internet users (18-29 year-olds) are more likely than their older counterparts to be online news participators, with just under half of that age group (46%) contributing to the creation, commentary, or dissemination of news online. Men and women are equally likely to participate in online news production. Participators also appreciate websites that make the news experience interactive, personal, and helpful to social engagement. Naturally, they also highly prize news sites that facilitate commenting on stories. And what kinds of stories would participators like to get more often from news organizations? They disproportionately say they would like more news about science and technology, state government, health and medicine, and their local community. When it comes to their news wish list, the biggest gap between participators and other Americans involves international affairs. 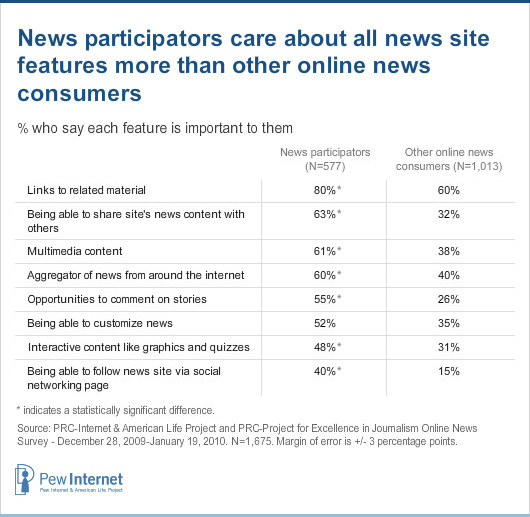 Some 42% of news participators say they would like more coverage of this topic by news organizations, compared with 28% of all other adults who desire more content of this nature.